In September 1930 the Ladies Aid rented a concession stand at the Nebraska State Fair and served lunch. Each year a different, better, and bigger stand was rented. In the 1940’s Dr. Frisbie, State 4-H leader, suggested the women rent a larger unit and serve a “balanced meal” to 4-H members. When the Lancaster County Poor Farm closed a kitchen stove and large cooking utensils were given to this project. With the larger facility more men were needed to carry the heavy work load and some took vacation time to work at the fair. In 1968, with the decisions to discontinue, the state fair management had the- building razed. The church for many years maintained a large Sunday School. The church basement was divided by curtains into many class rooms for the grade school groups The Primary department was in the space beneath the Brotherhood room, the high school boys in one of the classrooms adjacent to the sanctuary and the girls in the other. At one time the attendance reached 300. The Brotherhood Class met until the 1950’s. The women’s class, the Sisterhood Class, met for many years. Younger women met as the Friendly Class and later the Wesley Class was organized for both men and women. The summer of 1930 The Rev. F. M Druliner organized the first Bible School. The program consisted of Bible stories, children’s hymns, and recesses with directed games. Special materials for church school study were printed later. A cooperative Bible School was held with the Havelock Christian Church some summers which provided more teachers, “cool” rooms to use, and better music. Bible school was held in the public school building during the summer construction of the Methodist Church. The Ladies Aid and the foreign Missionary Society were reorganized February 11, 1940, and became the Women’s Society of Christian Service. The first General Meeting was held September 25, 1940. The organization of 70 members was divided into four groups, each with a number. Later names were chosen by the groups. Business. and professional women formed a Wesleyan Service Guild which later became part of Women’s Society of Christian Service. The Organization continued to be an ambitious group, working for the church, community and mission. Havelock Methodist Church mailed its first newsletter to the congregation in 1949. The name chosen was Hav-lock-Gram with the lock later becoming the shape of a padlock. The newsletter is now published once a month and is named the Have-O-Gram. The Rev. R. R. Kreps saw, as early as 1945, the need for a more modern facility. A new fund raising campaign was inaugurated in the fall of 1950 under the leadership of Rev. Clarence W. Smith. A kick-off banquet was held in the S1. Patrick’s Catholic Church across the street from the Havelock Methodist Church. Funds for the new church grew to $76,000 in cash and pledges. Planning went forward for the erection of a new church. Ground was broken March 30, 1952 and the cornerstone was laid May 4. The last service was held in the old church August 24, 1952. The fellowship hall was used for church services. 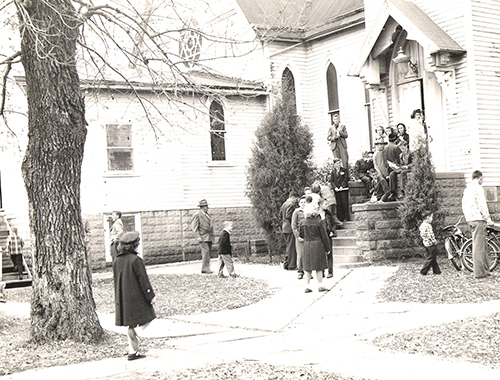 Identical services were held each Sunday, until the new sanctuary was finished, December 21, 1952. The finishing of the inside was done over several years. Volunteers from the men’s group, church school teachers, Women’s Society, individuals and even children came to sand woodwork and help in whatever way they could. The northeast corner of the outside hall of the sanctuary consists of a block of bricks the children purchased at a cost of five cents each with a slip of paper inside bearing the name of the purchaser. Chairs and other equipment were financed by the various departments. Little by little the rooms became attractive and functional. The consecration service was read by Nebraska Conference Bishop H. Bascom Watts, Sunday evening November 29, 1953. Rev. G. A. Randall preached the morning sermon. The new church was inadequate in every department, especially, the Sunday School rooms, dining room and kitchen by the time the details were finished. The Methodist Men were chartered on April 23, 1953 and meet monthly for breakfast and a program. They host an annual Mother’s Day and Valentine’s Day breakfast.